Led by Annette Schiller, the Bordeaux Tour 2018 by ombiasy WineTours took place from Tuesday, September 04, 2018 - Thursday, September 13, 2018. The group comprised 5 wine lovers from Australia and the United States, including Annette and Christian Schiller. This posting provides an overview. Future postings will focus on specific events of the tour. See the list of postings at the end of the article. Annette Schiller: Our way of traveling allows wine lovers to fully experience authentic Bordeaux. "Bordeaux" embodies not only "wine": The interplay of wine and food is very important. 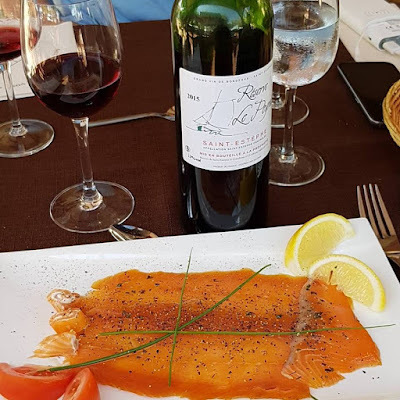 Therefore our tour has a strong culinary component, with exquisite wine pairing lunches and dinners at the Châteaux playing a daily part of our journey through the Bordeaux wine region. 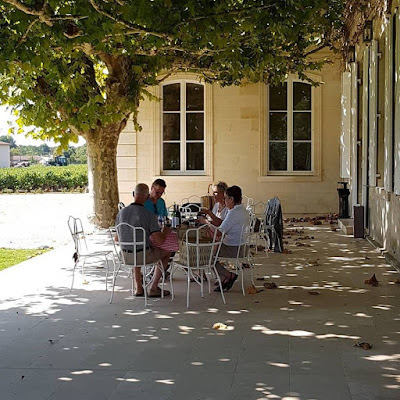 Drawing on our love and deep knowledge of the region and close personal ties to many of the Château owners/ managers/ winemakers, our small group visits many of the hidden gems that other tours pass by, but which are essential to feel what Bordeaux is all about. In a nutshell: this is an on the ground wine class on Bordeaux! Arrival in Bordeaux, check-in at Grand Hôtel Français, a refined lodging in an 18th century mansion right in the center of old town Bordeaux. The Grand Hôtel Français is in walking distance to all interesting places in Bordeaux City, with highly comfortable rooms. This hotel is part of the Best Western group. 01.00 pm Welcome coffee, meet and greet, and introduction to the Bordeaux wine region in the hotel. 02.00 pm Visit of the Wine Merchant House Maison Ginestet in Carignan-de-Bordeaux. Laurent Dupin from Maison Ginestet was our host. This was a fitting introduction to “Bordeaux”. In Bordeaux the wine merchants have always played a decisive part in the wine world. The buying and selling of wine, the setting of a price of a bottle of wine from a specific chateau for a specific vintage, the entire conduct of business is described as „La Place de Bordeaux“. The wine trade in Bordeaux goes back many centuries to the time when Aquitaine was English. Since then, set rules that appear mysterious to the outsider have been in place. We visited a Bordeaux lover’s paradise, a prominent wine merchant where millions of bottles of top Bordeaux wines are stored and waiting to be shipped. A stroll through the vast storage rooms feels like being a kid in a candy store. We were introduced to the rules, regulations, and peculiarities of the “Place de Bordeaux“. Maison Ginestet belongs to the small circle of ‘great Bordeaux wine houses. They sell and ship 15 million bottles of wine to around 70 countries worldwide. Besides being a “négociant” Maison Ginestet produces every day wine from bought fruit; they also own 350 hectar (825 acres!) in eight appellations around France; and they own three classified Châteaux – among them the second growth Gruaud-Larose – where they produce wines of top quality. 05.00 pm Tour and tasting at Château La Mission Haut-Brion, Appellation Pessac-Léognan, Grand Cru Classé de Grave. Barbara Wiesler-Appert was our host. We visited one of the most highly regarded Châteaux. The history of this Château is also closely intertwined with American heritage. Château La Mission Haut-Brion was founded in 1533, the same year as the neighboring Château Haut-Brion. In 1607 Château La Mission Haut-Brion was bequeathed to the Congregation of the Mission and became the property of the Roman Catholic Church. Napoleon’s secularization policies made it possible that a family from Louisana purchased the estate in 1815. In 1935 the American Clarence Dillon - also with roots in Louisana - purchased the next door estate Château Haut-Brion and later founded the Domaine Clarence Dillon. In 1983 the Domaine Clarence Dillon purchased Château La Mission Haut-Brion. Today Prince Robert of Luxembourg (great-grandson of Clarence Dillion, grandson of C. Douglas Dillon -US Secretary of the Treasury in the 60s-, son of Joan Dillon who married Prince Charles of Luxembourg) is President of Domaine Clarence Dillon. General Manager is Jean-Philippe Delmas, 3rd Delmas generation being responsible for the Domaine Clarence Dillon Châteaux. Château Haut-Brion as well as La Mission Haut-Brion produce red and white wines. At La Mission 98% of the production is red wine, 2 % is white. 6 times Robert Parker awarded La Mission Haut-Brion 100 Parker points. 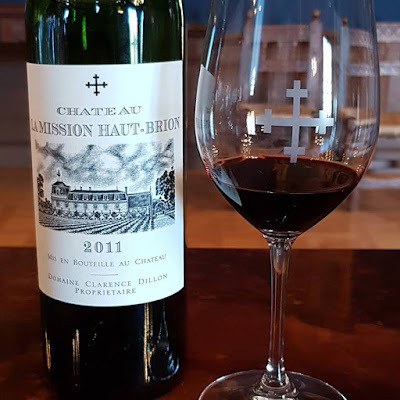 In 2009 Liv-Ex (the world’s most important wine exchange) reviewed the 1855 classification and recommended that Château Haut-Brion be elevated to Premier Grand Cru Classé, just as Mouton-Rothschild was elevated to this status in 1973. 08.00 pm Dinner at Restaurant L’Estacade in Bordeaux. The restaurant literally sits on the Garonne river opposite of Bordeaux city center. The view on the illuminated Place de la Bourse is breathtaking and makes you fall in love with Bordeaux right away. 09.15 am Departure from Bordeaux City and Drive to Blaye. 10.30 am Tour and Tasting at Château Mondésir Gazin, Appellation Côtes de Bourg, Appellation Blaye. Owner/ Winemaker Marc Pasquet was our host. This Château belongs to the so-called “Petits Châteaux”, the roughly 7000 Château that are not classified and not on the radar of the “label-drinkers”. There are many of these Château that produce excellent wines for a fraction of the classified wines. I quote the owners, since no one other than Laurence and Marc Pasquet could better explain why they purchased this estate: “Situated in Plassac, this estate is called after two hillside vineyard parcels – “Gazin”, facing directly south, and “Mondésir”, overlooking the Gironde estuary. The natural beauty of this landscape and the extremely high quality of these terroirs, incited us to acquire this property in 1990. Over the past 25 years, we have been unrelentingly committed to the elaboration of wines fully expressing the characteristics of this microclimate.” 35 acres of vineyards belong to the Château and consist of clayey-limestone slopes. The typical grape varieties used are Merlot, Cabernet-Sauvignon and Malbec. They use no chemical weed killers, no pesticides or anti-mold treatment. The grapes are always harvested entirely by hand. The extraction of the color and tannins is always smooth and slow. Planting 7 acres with 7 400 stocks per hectare was a small revolution in the region. This guaranties an excellent ratio between quality and price. 12.30 pm Departure and drive to Saint-Emilion. 01.30 pm Lunch at restaurant La Terrasse Rouge, Appellation Saimt-Emilion, Grand Cru Classé, in Saint-Emilion. La Terrasse Rouge is part of Château La Dominique, Appellation Saimt-Emilion, Grand Cru Classé, in Saint-Emilion, which is right next to Château Cheval Blanc. You also have a nice view of Pomerol. 03.15 pm Check-in at hotel Au Logis des Remparts in Saint-Emilion. Au Logis des Remparts is a very charming, well tended historic 3 + star, very upscale boutique hotel in the heart of UNESCO world heritage wine town Saint-Emilion with a stunning garden, beautiful views on the vineyards and a gorgeous outdoor pool. 04.15 pm Tour and tasting at Château Fourtet, Appellation Saint-Emilion, Premier Grand Cru Classé B. The history of Château Clos Fourtet goes back as far as the Middle Ages, some even say to Roman times. A defensive settlement was built to protect the town of Saint-Emilion and at the site of Clos Fourtet a military camp was constructed. From the 17th to the 19th century what is now Clos Fourtet was known as Campfourtet. The first vines were planted in the 17th century. The estate changed hands several times. In 2001 it was purchased by Philippe Cuvelier, a wealthy businessman from Paris. Today his son Matthieu Cuvelier is running the estate. He hired Stéphane Derenoncourt as oenological consultant. Stéphane Drenoncourt is also consultant at Boxwood winery in Middleburg, Virginia. 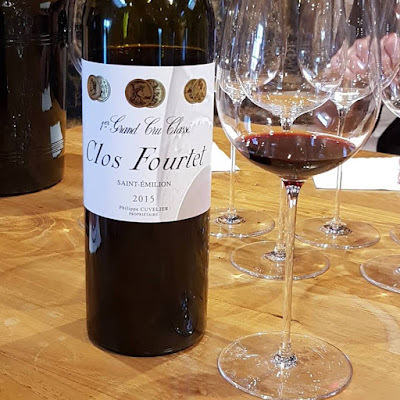 Château Clos Fourtet is located at the entrance of Saint-Emilion and the vineyards are just outside of town starting on the limestone plateau, on which Saint-Emilion sits, and slope down to the plains of clay to the west. The 50 acres of vineyards are planted with 85% Merlot, 10% Cabernet-Sauvignon, and 5% Cabernet-Franc. 06.30 pm Back to the hotel in Saint-Emilion. The evening was free to enjoy Saint-Emilion. There are many wine shops, restaurants, wine bars, and a wonderful “maison du vin” to visit. After touring the village, we ended up at the bar of Chai Pascal for dinner. 10.00 am Tour and tasting at Château La Conseillante, Appellation Pomerol. General Manager/ Winemaker Marielle Cazaux was our host. Pomerol is a tiny winegrowing region, located on the pilgrim road to Santiago de Compostela. Wine has been produced here since Roman times. Later the Knights of the Order of Malta cultivated the vines. In the Middle Ages, these knights established the Commanderie de Pomerol, which still exists today. This is one of the estates belonging to the upper echelon of Pomerol. The beginnings of Château La Conseillante go back to the mid 18th century. Madame Catherine Conseillan was owner and in charge of the estate and gave it its name. She had no heirs and the estate passed to relatives, was sold and bought a couple times and finally found its masters in the Nicolas family. It was Louis Nicolas, owner of a négociant business in Libourne, who purchased Château La Conseillante in 1871. Since then it has been continuously passed on to the next generation of the family and today the 5th generation is at the helm. In 1971 the estate underwent a thorough renovation and it was here that stainless steel, temperature controlled vats for fermentation were introduced. A second major renovation was completed in 2012 and concrete tanks were installed. This estate is relatively small – but typical for the right bank – compared with the châteaux on the left bank. 30 acres of vineyards belong to the château and 80% is planted with Merlot and the rest predominantly with Cabernet Franc. 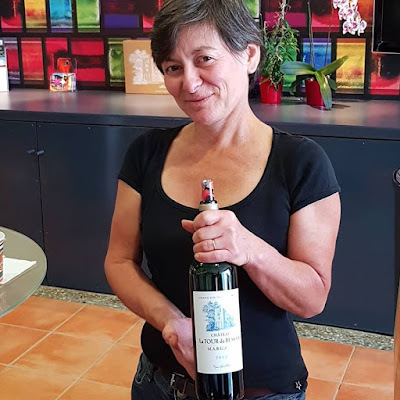 In 2015 a new director came on board, Marielle Cazaux, who studied enology at Bordeaux and was the director at neighboring Chateau Petit-Village before joining the team at La Conseillante. 11.45 am Tour at Château Le Bon Pasteur, Appellation Pomerol. Dany Rolland and General Manager/ Winemaker Benoît Prevot were our hosts. Château Le Bon Pasteur was acquired by the Rolland family around 1920. The grandson of the original owner, Michel Rolland, well known around the world as “flying winemaker” and wine consultant, and his wife Dany, a highly regarded oenologist in her own right created a model vineyard and produce outstanding wines. 12.45 pm Three course gourmet lunch with wine pairing at Château Le Bon Pasteur, with Dany Rolland and Benoît Prevot. Dany Rolland is a phenomenal hostess. 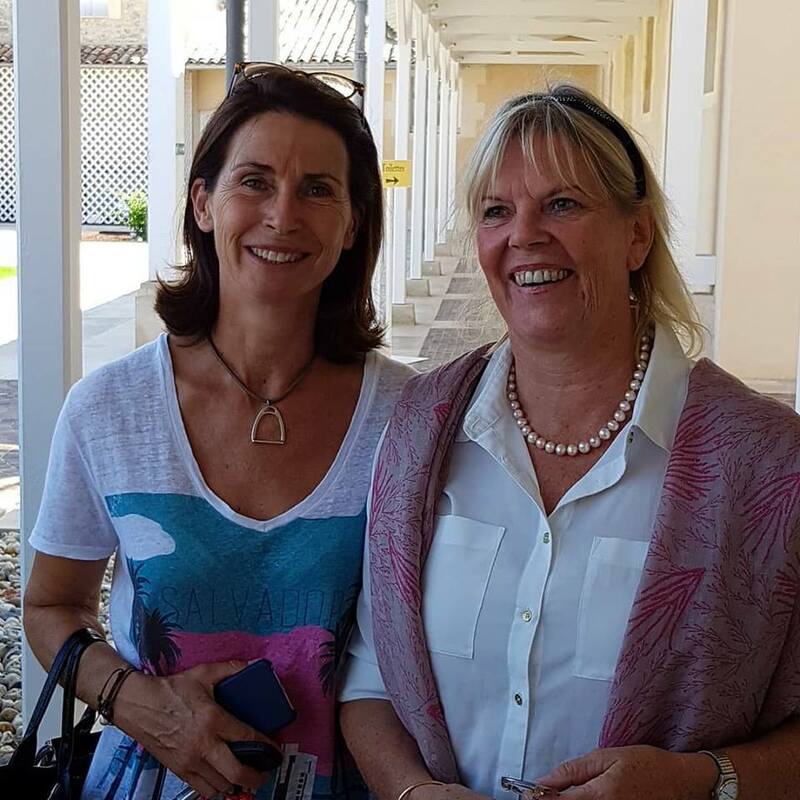 She joined us with General Manager/ Winemaker Benoît Prevot us for the luncheon. 04.00 pm Visit and tasting at Château Tertre-Rôteboeuf, Appellation Saint-Emilion. François Mitjavile, the owner and winemaker of Château Tertre-Rôteboeuf, was our host. This estate is located on a hill in Saint-Laurent de Combes with fantastic panoramic views of the vineyards in the Dordogne valley. We were welcomed by François Mitjavile, the owner of Château Tertre-Rôteboeuf. He is an exceptional winemaker, often unconventional in his views with regard to the mainstream wine scene in France. He is a maverick and refuses to take part in any classification system. His wines are brillant, unique and simply phenomenal. 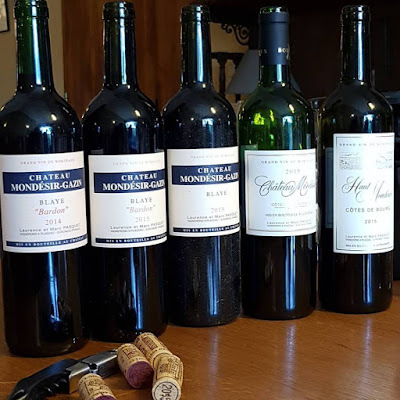 Since Robert Parker discovered these wines, prices very often exceed the prices of the wines from the premier grand cru classé estates. The tasting took place in the wine cellar of Château Tertre-Rôteboeuf and included the Château Tertre-Rôteboeuf. 2015 from barrel. 06.00 pm Back at Hotel Au Logis des Remparts in Saint-Emilion. Time to relax at the hotel or stroll through the beautiful village. 09.00 pm Nocturnal walking sightseeing tour through Saint-Emilion. An guide led us on a nocturnal walking sightseeing tour through the romantic, spectacular medieval town of Saint-Emilion perched on the edge of a limestone plateau. We also visited the underground monuments and the unique monolith church hewn into the rock the town rests on.Saint-Emilion is a UNESCO world heritage site! 09.00 am Departure from Saint-Emilion. We drove through the rolling hills of the “Entre Deux Mers” wine region to the Sauternes region. 10.30 am Vineyard tour, winery tour and tasting at Château Climens, Appellation Barsac-Sauterne, Première Grand Cru Classé. Owner/ Winemaker Bérénice Lurton was our host. Château Climens was first mentioned in 1547. Since then only five families called Climens their home, with the Lurton family being the last owner when Lucien Lurton bought the estate in 1971 (The Lurtons are one of Bordeaux's great wine dynasties. With more than 2,500 acres in the region, they are collectively Bordeaux's largest holder of wine-producing land. The family members own more than 20 châteaux and manage several well-known properties.). In 1992 Bérénice Lurton, Lucien Lurton’s youngest daughter took over the reins at Château Climens. The estate sits on the highest point in the Barsac appellation – a bit north of Sauterne- and is surrounded by 75 acres of vineyard. The vineyard is entirely planted with Sémillion -unusual for a Sauterne- that gives the Climens wines its racy complexity and freshness. Bérénice works in the vineyard according to biodynamic principles and in 2011 Château Climens received the biodyvin certification. 12.00 pm Wineparing Gourmet Lunch at Château Climens with Owner/ Winemaker Bérénice Lurton. Owner/ Winemaker Bérénice Lurton joined us for a wonderful wine-pairing luncheon with the wines of Château Climens. 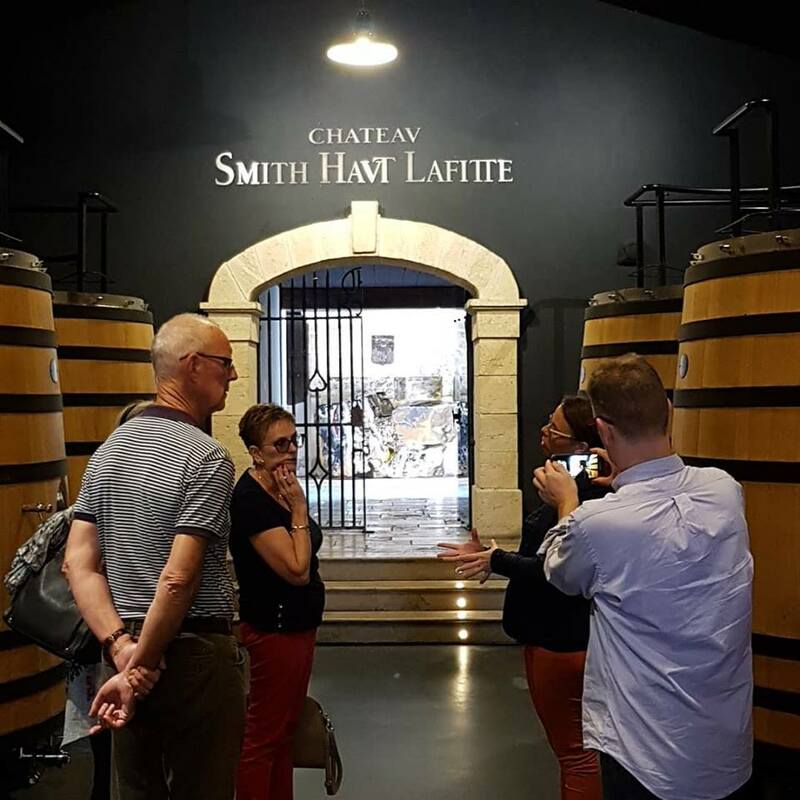 02.00 pm Winery tour and tasting at Château Smith-Haut-Lafitte, Appellation Pessac-Léognan, Grand Cru Classé. The noble Bosq family started growing grapes here as early as 1365. The property was purchased in the 18th century by Scotsman George Smith, who gave the estate its present name. He also built the manor house and exported his – by now famous – wine to England on his own ships. Current owners are Florence and Daniel Cathiard. Both Florence and Daniel were professional skiers belonging to the French Olympic ski team in the mid 60s (with triple gold medal legend at the 1968 Winter Olympics Jean-Claude Killy). After their career in sports, Daniel built a supermarket and sporting goods store imperium and Florence an advertising agency. In 1990 they bought Château Smith-Haut-Lafitte with the wealth generated by the sale of all their assets. 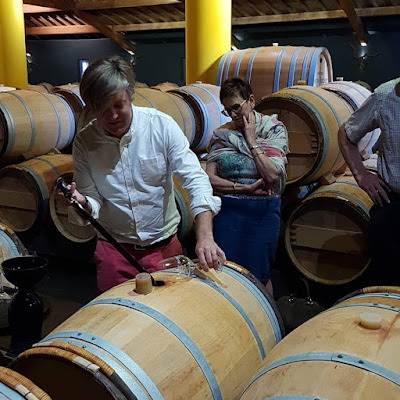 Daniel and Florence Cathiard invested heavily, restored buildings, replaced vats, constructed a new barrel cellar, converted vineyard practices to sustainable farming and paid detailed attention to hand picking, sorting, and practices in the cellar. They brought the quality of Smith-Haut-Lafitte wines to the level for which they were once renowned. 05.00 pm Back at the Grand Hôtel Français in Bordeaux City. The evening was free to discover the vibrant city of Bordeaux. It is fascinating to wander through the narrow streets lined with restaurants and wine bars always full to the brim with hungry and thirsty folks. 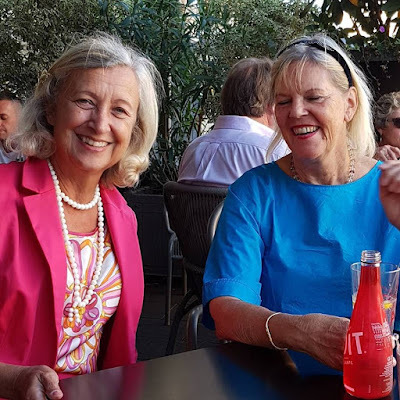 Before going out for dinner with the group, Annette and I met up with Sophie Shyler-Schröder, one of the owners of Château Kirwan. 10.30 pm Departure and drive to the village of Puisseguin Saint-Emilion. 11.30 pm Vineyard and winery tour at Château Beauséjour, Appellation Puisseguin Saint-Emilion. Owner/ Winemaker Gérard Dupuy was our host. For centuries Château Beauséjour (and nearby Château Langlais) have been in the possession of the Dupuy family. Since 1996 the Château is certified organic by “Ecocert”. 01.30 pm Wine pairing lunch at Château Beauséjour, Appellation Puisseguin Saint-Emilion. Gérard Dupuy hosted us for a wonderful wine pairing lunch, with the wines of Château Beauséjour. 03.30 pm Drive back to Bordeaux city. The rest of the afternoon was free to enjoy the city of Bordeaux. Among other things, the group went to the Le Bar à Vins at the l'Ecole du Vin. 09.00 am Check out of hotel and drive to the Arcachon Bay. The 90 minutes bus ride made us comprehend how close the Bordeaux wine region is to the Atlantic Ocean and how this proximity to the Gulf Stream and huge body of water influences the climate and thus the terroir. 10.30 am Arrival in Grand-Piquey, where we visited the Earl Ostrea Chanca oyster farm. Oyster Farmer Ralph Doerfler was our host. 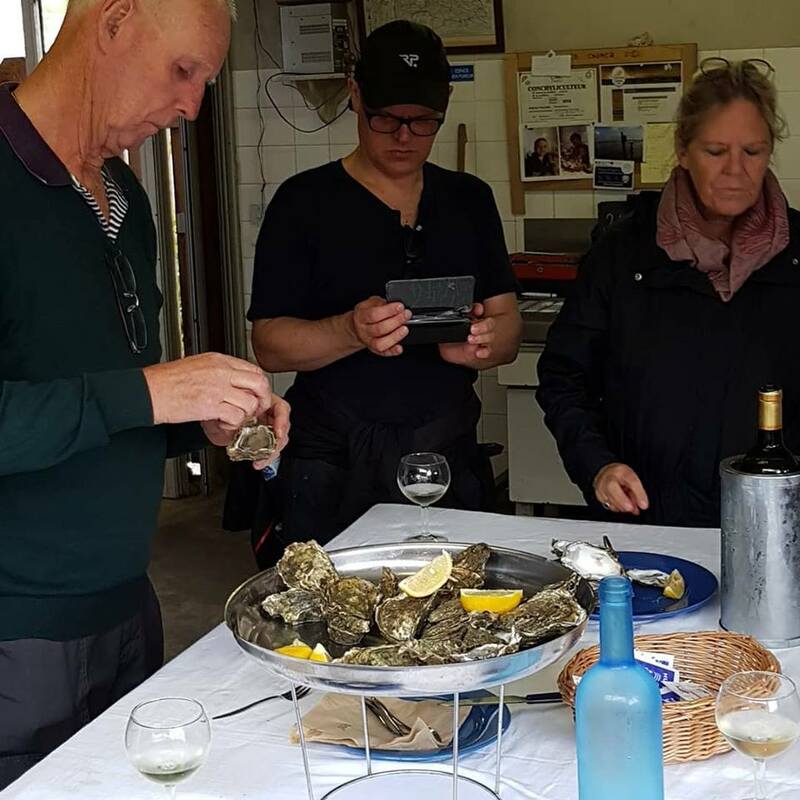 Ralph showed us how he raises his oysters and guided us through an oyster tasting. Ralph Doerfler loved the weekend family outings to visit his grandparents at their cabana on the Arcachon Bay when he was a child. 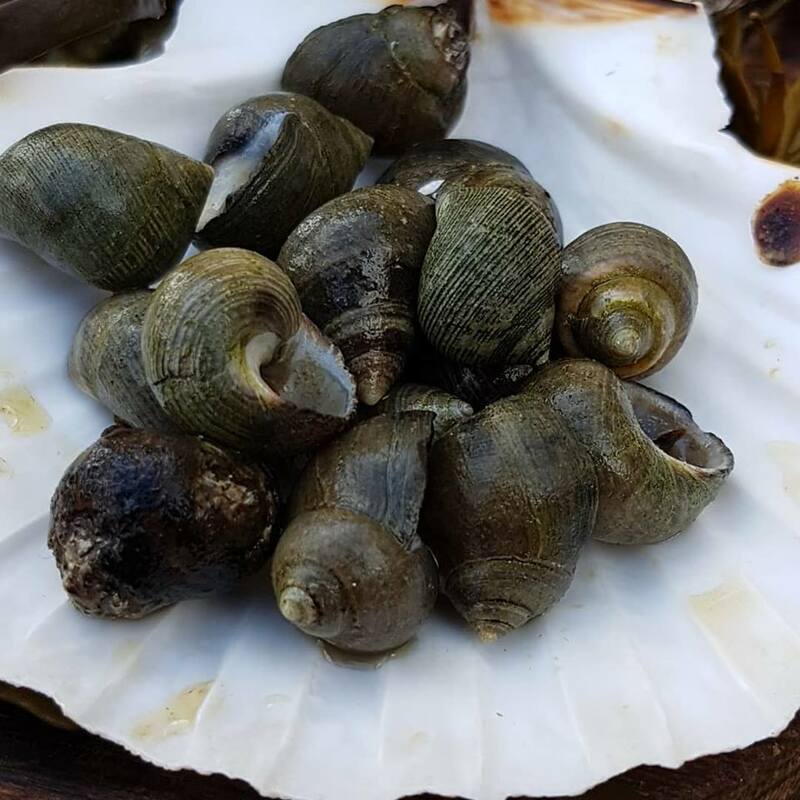 It was then that he fell in love with the sandy beaches of the bay, the life style away from the hustle and bustle of Bordeaux city, and the smell and taste of oysters. Growing up he decided to study and learn everything there is to know about oysters. 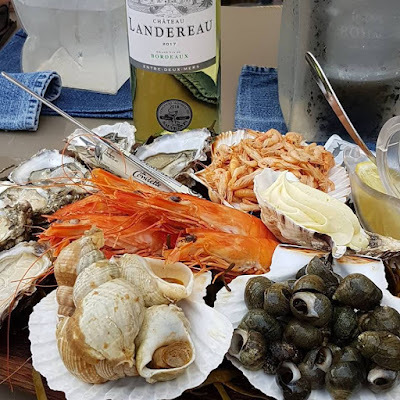 12.30 pm Lunch at Pinasse Café, Cap Ferret with a gorgeous view over the bay, the oyster farms and the village of Arcachon and the Dunes de Pilat, the largest in Europe, in the distance. 03.00 pm Departure from Cap Ferret and drive to Margaux, Médoc. 04.30 pm Visit and Tasting at Château La Tour de Bessan, Appellation Margaux, Cru Bourgois. Owner/ Winemaker Marie-Laure Lurton was our host. The origins of this property can be found in a 13th century tower situated in Soussans. Today there are only ruins left of this old fortified site. Wine was made at this site for centuries and the vineyards changed hands many times. In 1972 Lucien Lurton bought the tower and vineyards. He invested heavily into vineyards and cellars and brought the Château back on track. 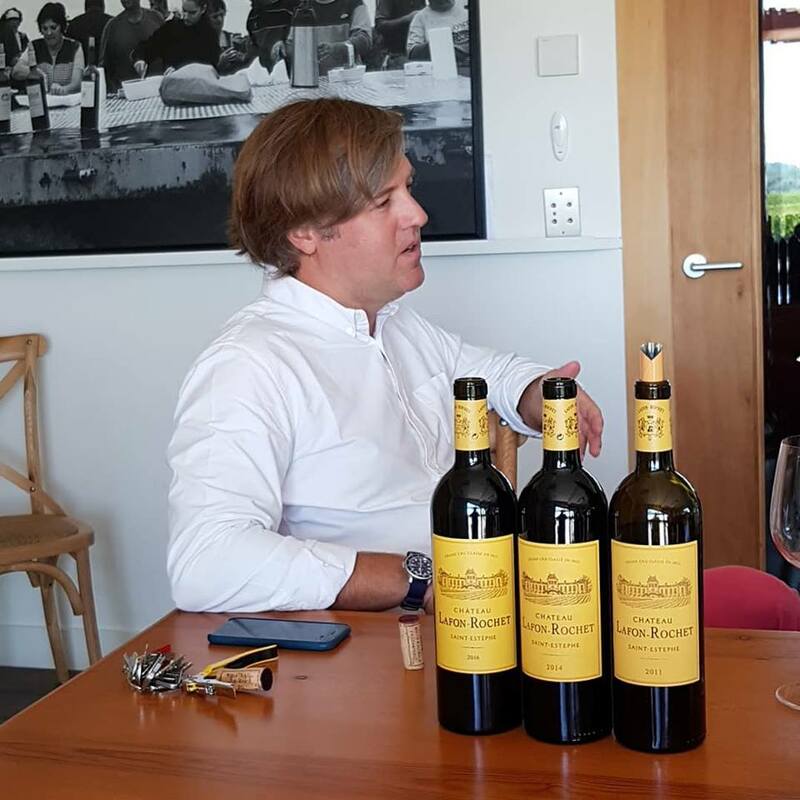 Lucien Lorton has since handed over the 11 estates he gradually acquired to his 10 children, including Château La Tour de Bessan to his daughter Marie-Laure in 1992. Marie-Laure Lurton has a winemaking degree and further developed the estate and focused on making top quality wines. She converted to eco friendly vineyard practices and was certified “Terra Vitis” in 2003. In 1999 she renovated an old building dating back to 1934 and constructed a beautiful contemporary building which should display the Château’s dynamic spirit. 06.15 pm Arrival and check-in at hotel Relais de Margaux in Margaux. Relais de Margaux in Margaux is a 4 star resort, spa, and golf hotel in a former late-19thcentury wine château right in the back yard of the famous Château Margaux. 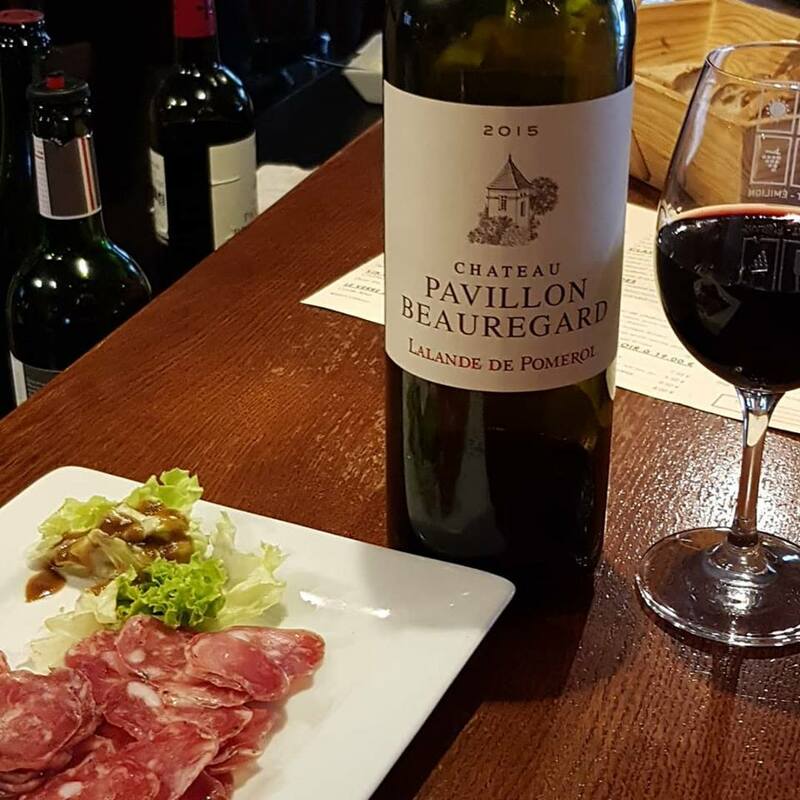 There is a very nice restaurant on the premises as well as a wine bar with excellent classified Bordeaux wines at a very decent price point. 09.30 am Winery tour and tasting at Château Durfort-Vivens, Appellation Margaux, 2ième Grand Cru Classé. Pauline Lurton, Export Manager North America and North Europe, was our host. In the cellar we met Technical Director Léopold Valentin. This is another Château owned by a member of the Lurton family. The history of Château Durfort-Vivens stretches back as far as the 14th century, when it was in the hands of the Durfort de Duras family. Throughout the centuries there was a succession of owners. In 1937 Pierre Ginestet (remember: the very first visit of this tour was to Maison Ginestet) bought the Château. 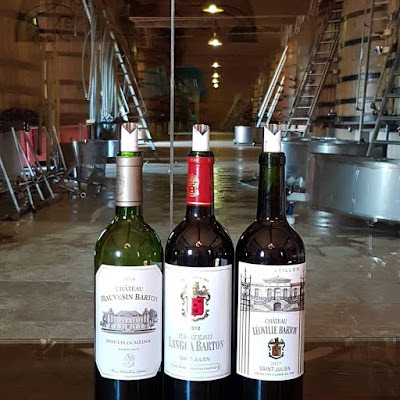 He also was the administrator of Château Margaux and for three decades the Durfort-Vivens wines were vinified in Château Margaux and hence they were regarded as being a second wine of Château Margaux. In 1961 the Ginestet family sold most of the Durfort-Vivens estate to Lucien Lurton. Lucien bought the vineyards and the cellars but not the actual Château building. Today the Château itself is named Château Marojallia and belongs to Philippe Porcheron. In 1992 Lucien gave Château Durfort-Vivens to his son Gonzague Lurton. Shortly after Gonzague took over he moved the wine making back to Durfort-Vivens. He built a new “chai” and installed new wooden and cement fermentation vats, complete with temperature control. In 1999 be began to convert to biodynamic viticulture and in the 2016 vintage the wine was certified biodynamic for the first time. 11.45 am Vineyard tour, cellar tour and tasting at Château Pichon-Longueville-Baron, Appellation Pauillac, 2ième Grand Cru Classé. Nicolas Santier, responsable du développement réceptif et tourisme, was our host. The history of this estate can be traced back to the late 17th century and matches the history of its twin estate across the street, Pichon Longueville-Comtesse de Lalande until the Pichon estate became divided in 1850 due to inheritance circumstances under the Napoleonic laws. Château Pichon-Baron (for short) stayed in the de Pichon-Longueville family until 1933 when the last surviving family member sold it to Jean Bouteiller, member of a family well-known in the Bordeaux wine scene. His heirs did not manage to keep the quality of the wines and in 1987 the estate was bought by AXA Millésimes, whose goal was to enable great wines from vineyards with a glorious past to achieve their full potential. Total reconstruction of the fermenting room and cellars, and renovation of the château itself, began in 1988. Excellent terroir across from the 1st growth Latour property, stretching south bordering the Léoville estates in Saint-Julien gives the wines elegance, balance, and finesse. 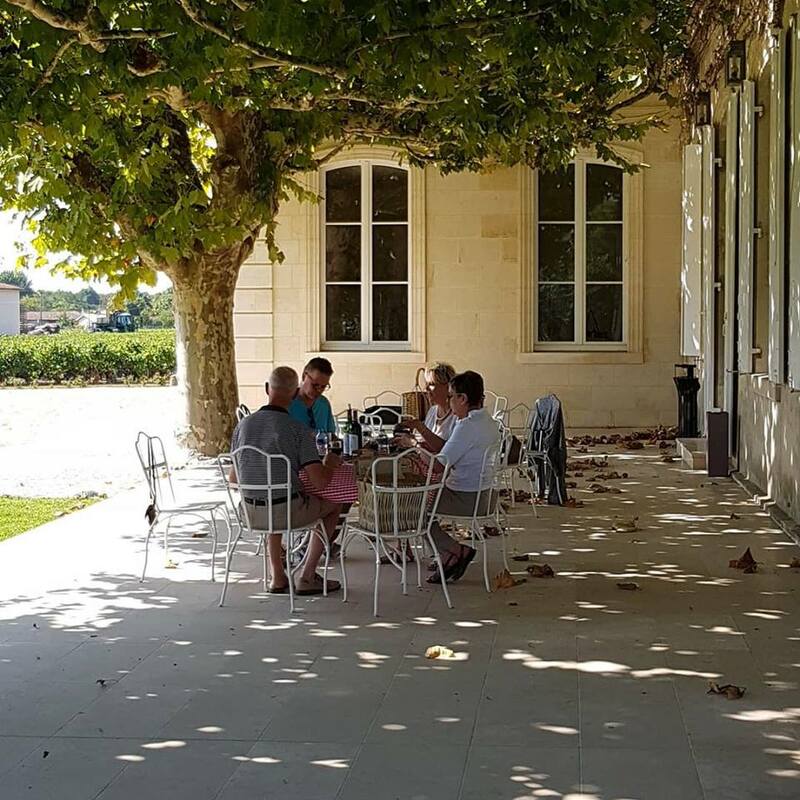 The elegance of the wines in combination with the beautiful, graceful Château, which is one of the most stunning ones in the Médoc, make this estate very special. 01.00 pm Wine pairing luncheon at at Château Pichon-Longueville-Baron. 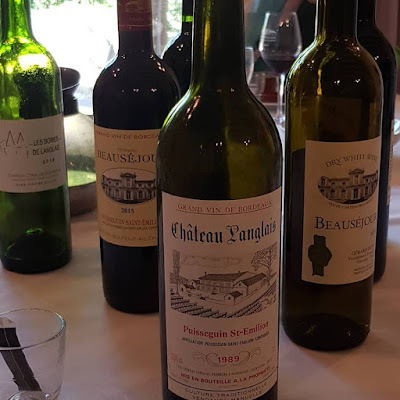 Following the tour we had a private lunch at Château Pichon-Longueville-Baron.We were greeted with a Champagne followed by an excellent gourmet meal matched by the fabulous Pichon-Longueville-Baron wines. 03.15 pm Arrival and check-in at Hotel/Restaurant Le Vignoble-France et Angleterre in Pauillac. Hotel Le Vignoble-France et Angleterre in Pauillac is a very well equipped, privately owned 3 star hotel in the heart of the Médoc region, right on the waterfront of the Gironde estuary. 05.00 pm Visit and tasting at Château Ormez de Pez, Appellation Saint-Estèphe. Kerstin Bauer, Guide Interprete, was our host. Jean-Charles Cazes, the grandfather of the current owner, purchased Château Lynch Bages and Château Ormes de Pez on the eve of the Second World War. The vineyard area of Ormez de Pez extends over 80 acres, with 70% Cabernet Sauvignon, 10% Cabernet Franc and 20% Merlot. The annual production is 15,000 cases. Château Ormes-de-Pez is in the Saint-Estèphe appellation. In the 2003 listing that was later annulled, Château Les Ormes-de-Pez was classified as one of 9 Cru Bourgeois Exceptionnels. It belongs to the group of six former Cru Bourgeois Exceptionnel estates (Château Chasse Spleen, Château Les Ormes de Pez, Château de Pez, Château Potensac, Château Poujeaux and Château Siran) that have decided to remain outside the Cru Bourgeois Classification. Lynches-Bages has 225 acres under vines with 75% Cabernet Sauvignon, 17% Merlot, 6% Cabernet Franc and 2% Petit Verdot. They also produce white wines on 18 acres planted with 53% Sauvignon Blanc, 32% Semillon and 15% Muscadelle. The history of the estate reflects the interesting history of English and French rule in Aquitaine. The original owners, the Lynch family from Ireland, could trace back their roots to an ancestor who was a companion of William the Conqueror. Without an heir, in 1824 the estate was sold and was in the hands of two other families before the Cazes family took over the property in 1933. Since then, the Cazes family has developed both estates with passion and tenacity and started an in-depth modernisation in the 1980s. 08.30 am Departure and drive to Vertheuil. Along the route we passed by the famous Châteaux Mouton Rothschild and Lafite Rothschild as well as Cos d’Estournel. 09.00 am Arrival in the village of Vertheuil, where we visited the cooperage Berger & Fils and witnessed the fascinating art of making a “real” barrique. Berger & Fils is one of the top notch cooperages in Franc. Only the top gun châteaux order their barrels here. 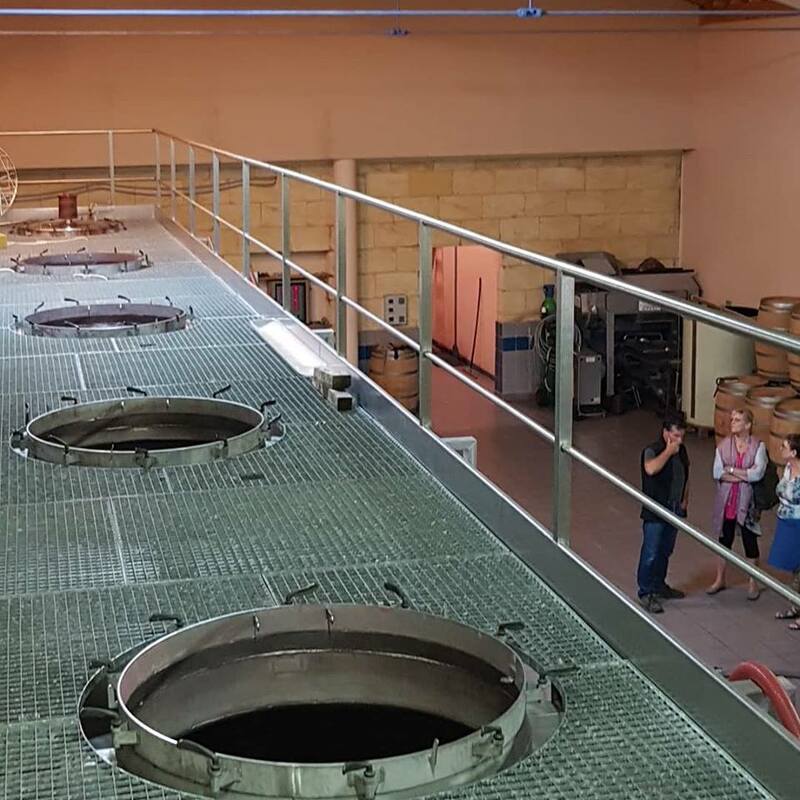 It is a small enterprise, and everyone working there strives to make the best and perfect barrique for the wine to ferment and mature to perfection. Simon Grelier, Managing Director, was our host. 11.15 am Winery tour and tasting, including from barrel, at Château Lafon-Rochet, Appellation Saint-Estèphe, 4ième Grand Cru Classé. Owner Basile Tesseron was our host. This Château features some of the finest vineyards in the world. 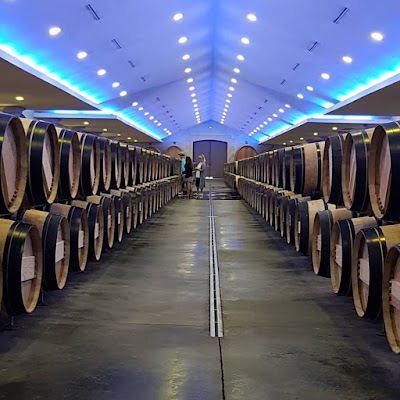 It is situated in the small appellation Saint-Estèphe and is sandwiched between two prominent neighbors: Cos-d’Estournel on the other side of the street and Lafite-Rothschild, separated only by a small dirt track, and visible across the vineyard that belongs to Lafon-Rochet. Since the 16th century this Château makes excellent wines and had been in the hands of the Lafon family for almost 300 years. In 1895 the phylloxera disaster forced the family to sell Château Lafon-Rochet. A period of a rapid succession of several disinterested owners followed until Guy Tesseron (who also bought Château Pontet-Canet) acquired the Château in the 1960s. He and then his son Michel brought Lafon-Rochet back to its former glory. The new generation is now at the helm and Basile Tesseron is energetically pursuing quality control. 01.15 pm Lunch at restaurant Le Peyrat in Saint-Estèphe, right on the banks of the Gironde. This unassuming, very traditional French restaurant is always packed for lunch, because it is the favorite hangout for the winemakers of the neighboring châteaux. During harvest the pickers of Château Sociando-Mallet and other close by châteaux have lunch here. 03.00 pm Winery tour and tasting at Château Léoville-Poyferré, Appellation Saint-Julien, 2ième Grand Cru Classé. The Léoville Poyferré estate exists as its own domain since 1840, when the big Léoville property was divided into three smaller entities. The current owner, the Cuvelier family bought Château Léoville Poyferré in 1920. At that time the Cuvelier family was already established in the wine business as important wine merchants in northern France. 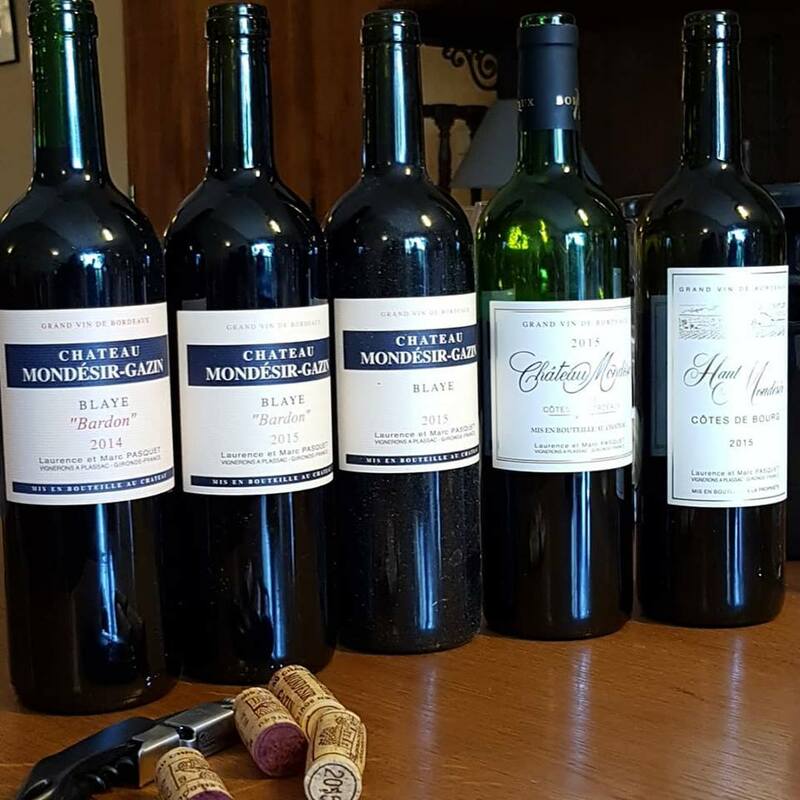 Since 1979 Didier Cuvelier, has managed the estate. 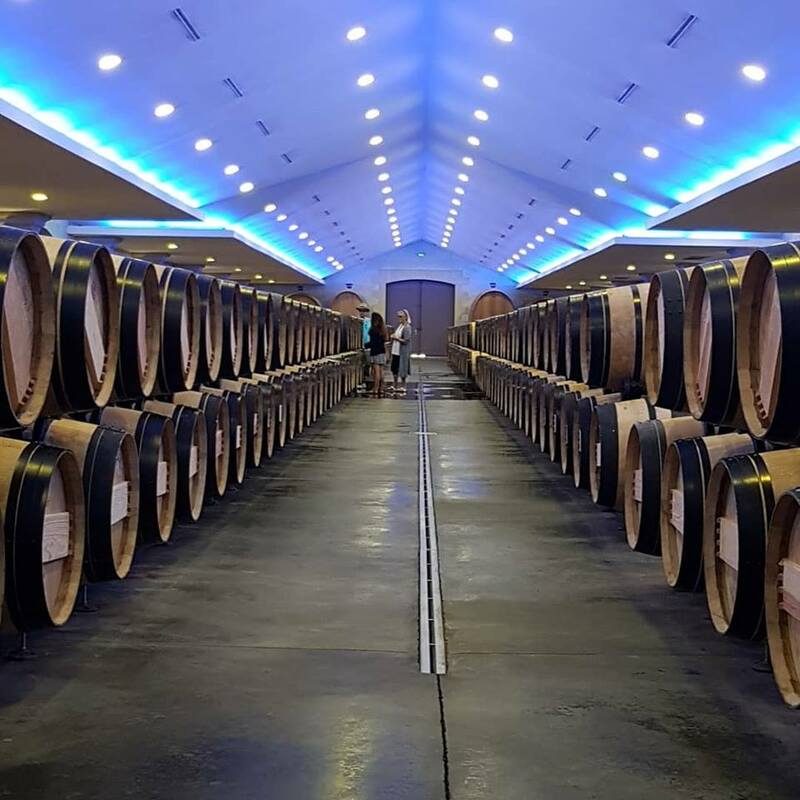 Under his leadership, constant improvements have been undertaken, including a state of the art optical sorting machine in the cellar and the wines have become one of the most sought after in the Médoc. This year, he has handed over to Sara Lecompte-Cuvelier, who welcomed us. We also had a chance to meet long-time cellar master Didier Thomann. 05.30 pm Tour at Château Le Reysse, Vignobles Paeffgen, Appellation Médoc. Owner/ winemaker Stefan Paeffgen was our host. The Medoc sits north of St.-Estèphe, downstream on the Gironde estuary and embraces Pauillac and Saint-Julien to the west.Château Le Reysse was run by Patrick Chaumont, the second generation owner, for several decades. 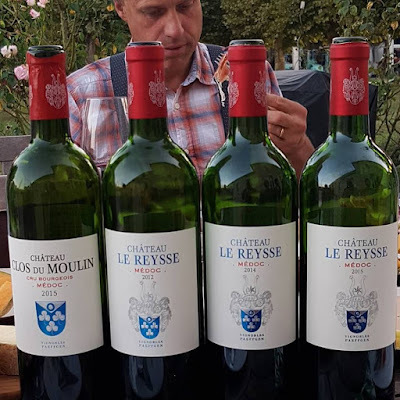 In 2010 Château Le Reysse was bought by Stefan Paeffgen, who holds a Doctorate in agricultural science and who in another life worked in the agriculture industry in his home country Germany and in Scandinavia. 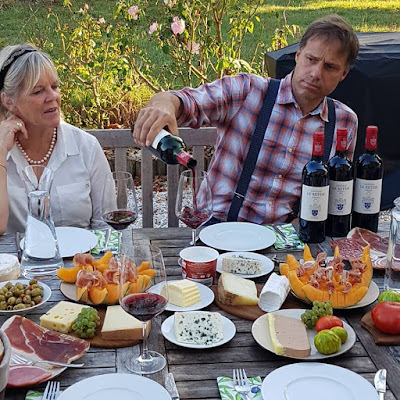 He always had a passion for the wines of the Médoc and at age 46, he was at a crossroad and made the decision to go back to practical agriculture. He searched for a winery and finally found this great spot in Bégadan. He now owns four smaller win estates. Stefan and Heike Paeffgen, who also is an agricultural scientist, are very much in tune with nature and farm the vineyards ecologically. Château Le Reysse is the family's home. Stefan makes stunning wines and his wine of Château Clos du Moulin was awarded the Cru Bourgois classification. 06.30 pm Family-style Dinner and Wine Tasting with Stefan Paeffgen and his Wife. Following the tour we enjoyed a supper with charcuterie, cheese, baguette, wine at Château Le Reysse. The weather cooperated and we could sit outside in the romantic park. 09.15 am Winery tour and tasting at Château Léoville-Barton, Appellation Saint-Julien, 2ième Grand Cru Classé and Château Langoa Barton, Appellation Saint-Julien, 3ième Grand Cru Classé. The story of all three Léoville estates begins when the Dutch drained the marshland in the Medoc to create more land. It was in 1638 when Léoville, one of the first estates in the Médoc was founded in Saint-Julien. In the course of the riots and commotion of the French Revolution the big Léoville estate was confiscated in 1794 and later divided into smaller entities. Château Léoville-Barton exists as its own domain since 1826, when Hugh Barton was able to purchase one part of the former Léoville property. The Barton family was already well known in Bordeaux. Thomas Barton had left his native Ireland 100 years ago in 1722. He and his heirs had established themselves in the Bordeaux wine trade as able businessmen. The Château is still the property of the Barton family who can look back on 300 years of continuous work in the Bordeaux wine business. Today it is the 9th generation, Lillian Barton Sartorius, running the estate. The 10th generation, oenologist Mélanie Barton Sartorius and commerce and business expert Damien Barton Sartorius, is well prepared to take over eventually. 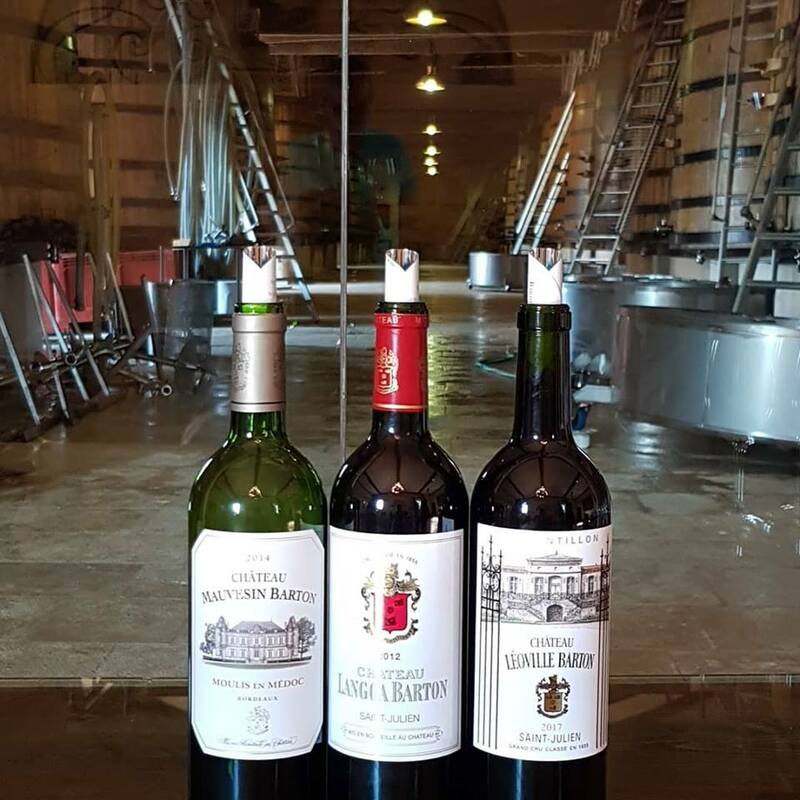 Besides Château Léoville Barton the family also owns Château Langoa Barton, the first wine estate bought by Hugh Barton in 1822 and Chateau Mauvesin Barton in Moulis (Médoc), a domaine that was purchased by the family in 2011. 11.45 am Winery tour and tasting at Château Lascombes, Appellation Margaux, 2ième Grand Cru Classé. Given its history this is a very interesting Château to visit. In the late 17th century the estate belonged to the Chevalier de Lascombes, hence the name. Since then the Château passed through a succession of owners some more successful than others. In 1855 it was awarded the status of a second growth. Since then for most of the time it had been considered an underperformer in relation to its classification. In 1952 the estate was purchased by the flamboyant Russian-French wine writer and wine connoisseur Alexis Lichine and a syndicate of American investors that included David Rockefeller. Alexis Lichine laid the ground-work for the rehabilitation of Château Lascombes by greatly improving the vineyards with his expertise and commitment. It was only in 2001 that the Château Lascombes as we know it today came into being. That year the Amercian pension fund Capital Colony purchased the estate and completely turned it around by investing € 35 Mil in the renovation of equipment, cellars, vineyards, etc. Dominique Befve was hired as General Manager and Michel Rolland as oenologist. In 2011 Château Lascombes was acquired by the French insurance company MACSF. The new owners have retained the Capital Colony winemaking team, including Dominique Befve. Château Lascombes is with 225 acres of vineyards one of the largest classified estates in the Médoc. 01.00 pm Following the winery tour we enjoyed a fabulous lunch pique-nique style with matching Lascombes wines at the château. 06.00 pm Winery tour of Château Haut-Bailly, Graves, Appellation Pessac-Léognan, Grand Cru Classé. Daina Paulin was our host. At Château Haut-Bailly wine has been produced for more than five centuries. Like many Bordeaux estates, the property changed owners multiple times over the centuries. However, three owner families put their mark on the estate. In 1630 it was bought by the Le Bailly family which eventually gave the estate its name. In those days the château had about 80 acres under vine, roughly the same as today. There were many ups and downs during the centuries and by the 1950s the estate was in a sorry state. A wine merchant from Belgium, Daniel Sanders, bought the château in 1955 and started intensive renovations. 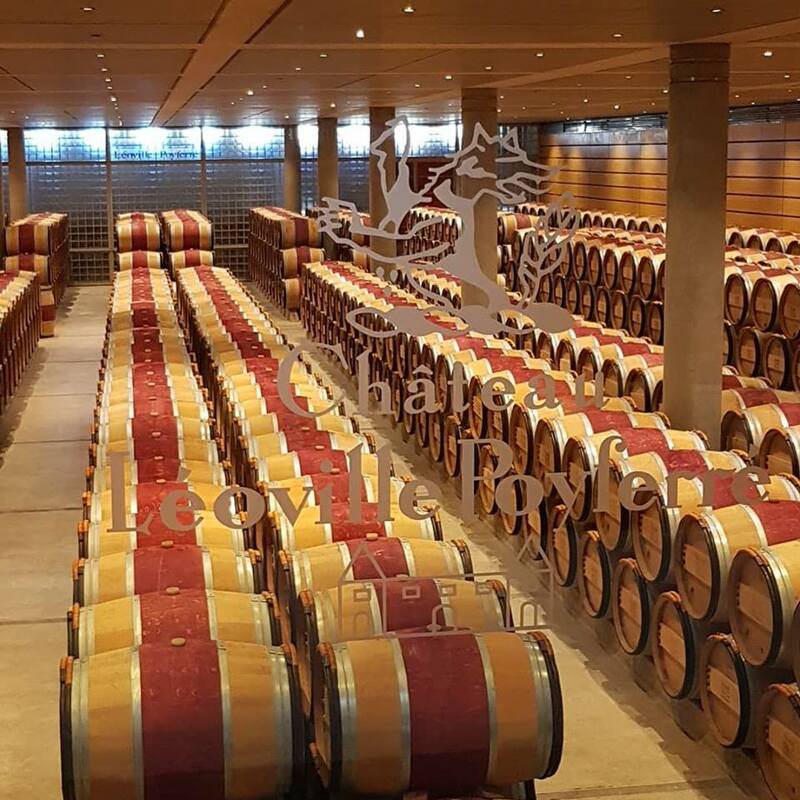 His efforts proofed him right and Château Haut-Bailly was one of the 16 wine producers awarded with the Grand Cru Classé certification in the 1959 classification of the Graves estates. 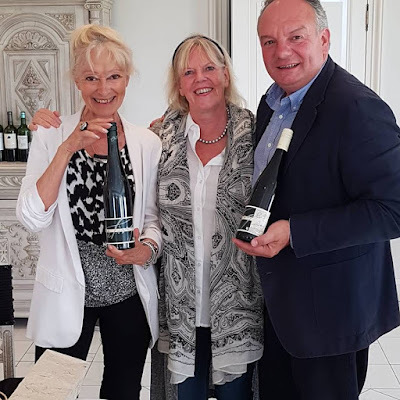 In 1998, Elisabeth and Robert G. Wilmers – he was an American banker (he passed away earlier this year), she is French – bought Château Haut-Bailly and spared no expenses to invest in the vineyards, winery, and the château to give the estate the possibility to keep producing top quality wines. Château Haut-Bailly is managed by Véronique Sanders, fourth generation of the Sanders family. Véronique Sanders and Robert G. Wilmers work hand in hand sharing the goal to produce top notch wines of outstanding character. 7.30 pm Gourmet Dinner with Wine-pairing at Château Haut-Bailly. We enjoyed a four course wine pairing gourmet dinner in the beautiful private quarters of Château Haut-Bailly. We started with Champagne on the terrasse, watching the sun going down. We then proceed to the dining room and were served a meal – worthy of a Michelin-star - prepared by the private chef. Daina Paulin poured a selection of Château Haut-Bailly wines. After dinner we moved to the living room for tea and had the opportunity to tour the kitchen to personally thank Chef Jean-Charles Poinsot for his inspirational menu. This exclusive dinner celebration in the private living quarters of the owner was be the perfect finale of our wine and gourmet tour. 09.00 am Breakfast buffet at the hotel. This was our last activity together. After breakfast the tour ended. Tour and tasting at Château Fourtet, Appellation Saint-Emilion, Premier Grand Cru Classé B.